Cocotte, La French Rôtisserie opened in May 2017. This beautifully designed shop is South Africa’s first typical French Rôtisserie take-away. Born out of the co-founders, Catherine Lauria and Delphine Stein-de Beer’s love for good food and for the people of South Africa, Cocotte offers a little piece of Paris, in the form of dine-in decadence for people on the go. Whole free-range chickens are roasted in a special rotating oven (rôtissoire) imported from France. Rôtisseries’ are widespread across city streets in France, and now this simple but delicious treat is available in Cape Town as well! And let’s not forget the contemporary decor! Internationally acclaimed Belgian designer Laurence Soetens designed the shop’s contemporary look and feel made up entirely of tiles for the walls and floor inspired by the look of a typical butchery/Rotisserie in France. A total of 7500 small, staggered white ceramic tiles cover the walls from floor to ceiling. This has been complimented with larger black and white floor tiles laid in a geometric pattern, creating a unique space and replicating the ambience of a French bistro. Every detail of Cocotte, La French Rôtisserie is an invitation to travel to France. When opening in 2017, the Cocotte, La French Rôtisserie’s team were looking for a POS solution that would allow them to follow their sales’ data in order to buy the right quantity of fresh produce based on the anticipated demand. In addition, the team wanted to address cash and stock control problems, which are a major risk in South Africa. Cocotte, La French Rôtisserie uses a variety of iKentoo’s features and modules to optimize the management of their business. In addition the operational features of the iKentoo POS, the team had several specific needs. They use Back-Office sales reports to analyze sales trends and anticipate the demand, a key factor for a business that relies heavily on fresh produce. Furthermore, the Back-Office’s stock management module and different payment methods help prevent cash and stock discrepancies. The team also uses several mobile and digital payment solutions that are directly integrated with iKentoo which make it possible to accept a wide variety of cashless payment methods (credit / debit cards with Yoco, mobile app payment with Zapper and Snapscan). 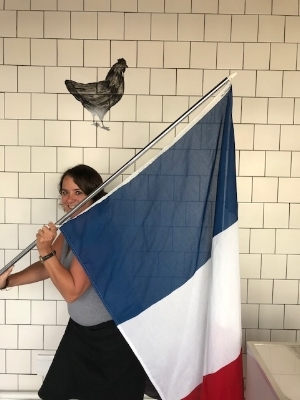 Analyzing sales data allow Cocotte, La French Rôtisserie to avoid overstocking fresh produce, thus mitigating food waste while offering healthy options and free-range locally grown chicken. This has led to reduced food waste, and better margins. The structured and illustrative business information found in the Back-Office simplify Cocotte, La French Rôtisserie’s remote management. This lets the team manage the business in real-time, from anywhere in the world. In addition to that, iKentoo helps reduce the risks of cash and stock problems thanks to real time information being available on the cell phone, two major risks in South Africa according Catherine Lauria. This translates directly to better financial performance, and finally, iKentoo being a SaaS (Software as a Service) it comes as an all-in-one package with no additional costs providing the team with an all-in-one flexible solution that benefits their small business.